Several centuries ago, Europe witnessed a movement which was to have tremendous impact on the both the continent and the wider world. This was the Reformation – the great crusade which was to renew the church and divide it into the Roman Catholic and Protestant branches. Historians have identified three principles which were central in this great movement. These principles marked a decisive breach with the theology of the Roman Catholic church at the time of the Reformation, and it is still so today. Points 2 and 3 derive from principle 1, but this relation can be easily forgotten and so needs to be regularly pointed out. When we come to reflect on this, we would realize that the Reformation was a radical return to the scriptures, the Word of God. And it was from this that the above and all other principles flow. 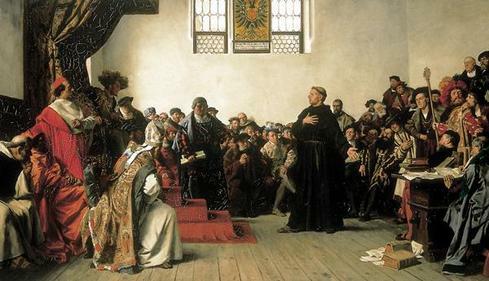 Luther was born into Christendom, that complex web of human society moderated and governed by the Church. And what was the authority for the life of this institution? A mix of scripture and tradition. It was God’s word alongside Man’s word, coexisting and coequal, just like the Persons of the Trinity. Such a tie created problems for the worshiper because it brought God down to the level of his creature and effectively made God’s word subject to human authority. It introduced false teachings (e.g. Purgatory) into the church which could not be criticized because they had the support of the Church. And the believer was denied the joy of true worship because he was bound to live by the decrees and pronouncements of men. The Reformation looked beyond all that humans (whether Popes or Kings) could say or had said, and returned back to the fountain of truth, the Word of God, for what to believe and to do. And at this fountain, the worshiper found relief from his burden of guilt in the doctrine of Justification by faith. He found divinely-bestowed dignity in the Priesthood of all believers. He found comfort in knowing that his sins were forgiven – not in the future, but right now – in the doctrine of Assurance. This fountain held forth a promise of greater treasures yet unexplored and undiscovered. And in this the most significant characteristic of the Protestant and evangelical wing of the Church emerges: a resolve to return to this fountain in resolving any theological or religious matter. Therefore we must not consider human writings– no matter how holy their authors may have been– equal to the divine writings; nor may we put custom, nor the majority, nor age, nor the passage of time or persons, nor councils, decrees, or official decisions above the truth of God, for truth is above everything else. Therefore, beyond all the disputes about the divine presence at the Lord’s Supper, the form of government, or the role of the church in society, this was the most important fruit of the reformation – a recovery of the absolute authority of God speaking through his word. This was the principle of the Reformation and this is the truth that our world must re-embrace today.